Special Counsel Robert Mueller’s conclusion that US President Donald Trump’s campaign did not collude with Russia in the 2016 election is a serious blow to Democrats who had hoped Mueller’s report would boost their own wide-ranging probes into Trump’s business dealings. Still, Attorney General William Barr’s summary of Mueller’s final report appeared to significantly reduce the risk of impeachment that had hovered over Trump almost since he took office on Jan. 20, 2017. “Bad day for those hoping the Mueller investigation would take President Trump down,” Republican Senator Lindsey Graham observed. “It’s one of those hard realities that sometimes things don’t turn out the way you wanted them to,” said Democratic political consultant Colin Strother, who is based in Austin, Texas. “The President should get off the golf course and end his constant vacations. Back in Washington @HouseDemocrats are fighting to lower healthcare costs and fix our crumbling infrastructure,” tweeted Hakeem Jeffries, who heads the House of Representatives’ Democratic Caucus, as word of Mueller’s findings spread across the world. Democratic chairmen of three key committees - Intelligence, Oversight and Foreign Affairs - also sought documents about Trump’s conversations with Russian President Vladimir Putin. All they needed was a stinging condemnation from Mueller of Trump’s behavior to give their probes liftoff. 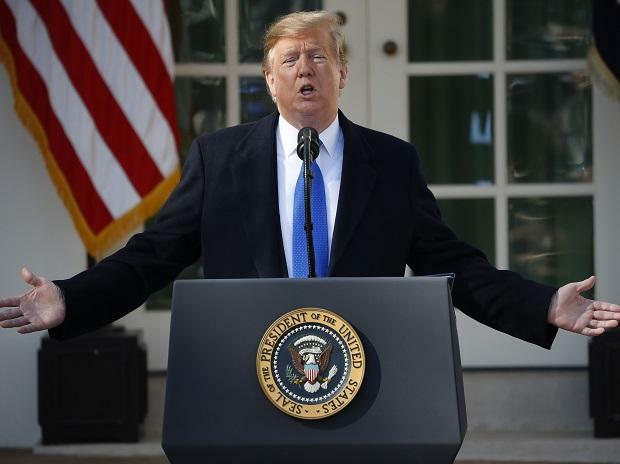 Now, with Barr notifying Congress that Mueller found no evidence that Trump or anyone in his presidential campaign colluded with Russia’s meddling in the 2016 election, impeachment was seen as much less likely, barring new developments. “It doesn’t look like there’s impeachment. Democratic leaders were already backing away from it,” said Elaine Kamarck, a senior fellow at the liberal-leaning Brookings Institution in Washington. All through last year’s congressional election campaigns, Pelosi warned that any impeachment effort against Trump would fail unless Republicans joined Democrats in the effort. That appears virtually impossible now that Republicans can point to Mueller finding no collusion and not recommending any definitive action on obstruction of justice on Trump’s part. “Clearly for Democrats to propose pursuing impeachment when Mueller apparently did not find evidence of collusion and conspiracy between the Trump campaign and the Russians would be a mistake,” said Bruce Gyory, a Democratic political consultant based in Albany, New York. Pelosi and Senate Democratic leader Chuck Schumer called on Barr to make Mueller’s report public, and gave their support to continuing the probes of Trump. Those investigations could now shift to issues involving emoluments and potential conflicts of interest posed by Trump’s business empire, especially as Trump and close allies still face federal investigations in New York. While Democrats’ congressional hearings are not likely to quietly fade away in coming days and weeks, there is now more risk attached to them. “We’ll look as ridiculous as the Republicans did during the Obama administration if we continue down some path of calling for an impeachment when there is no cause,” Strother said.